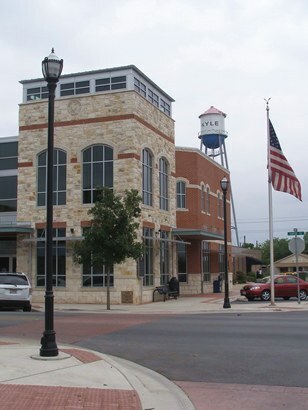 Kyle is Hays County's second city. 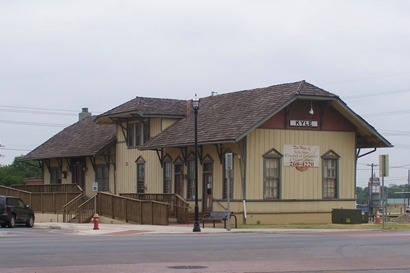 Jay Gould, the 19th Century railroad magnate decided that his International-Great Northern Railroad needed a station between Austin and San Marcos. 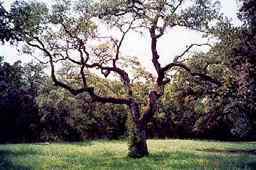 He made a deal with property owners David Moore and Fergus Kyle and 200 acres of their former land was auctioned off in 1880 under the Kyle Auction Oak. By 1881, Kyle had four saloons and a newspaper (The Kyle Nutshell) so that the saloon patrons had something to read between drinks. 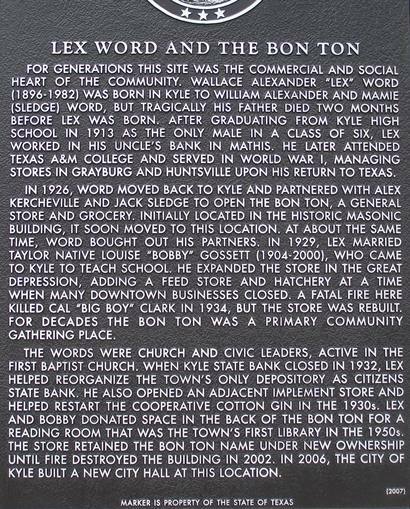 Many anecdotal stories of Kyle's first years are included in Richard Zelade's Hill County, Lone Star Books (Gulf Publishing) 1999. 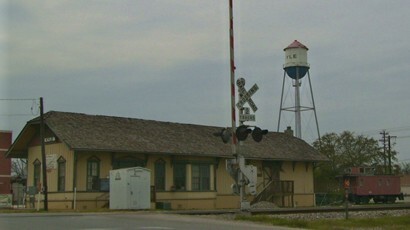 In 1895 the city incorporated the first time. Two years later they decided it was a bad idea. 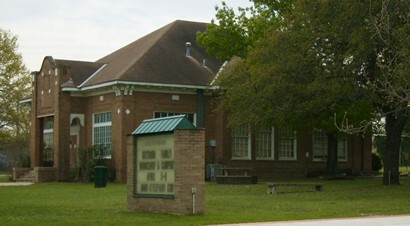 The second incorporation in 1906 held. 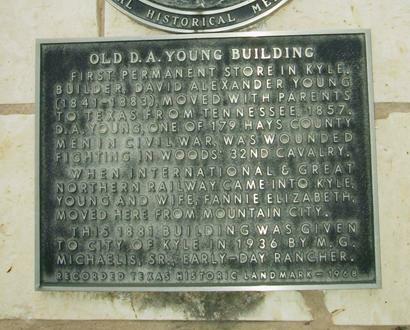 Kyle suffered several fires in its history, which accounts for the missing buildings. 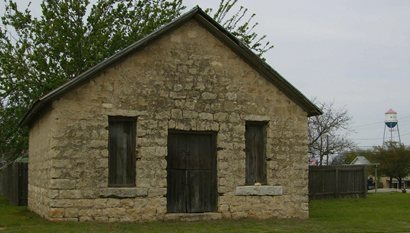 Surviving buildings date back to the 1890s. 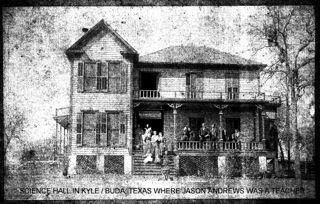 "My family had farming interests in Kyle and Buda and my great grandfather founded Science Hall when he migrated to Texas from North Carolina after the Civil War. 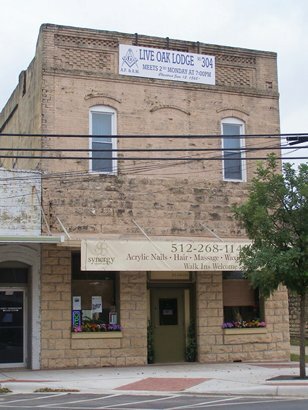 Here is an old photo of the original Science Hall"
Kyle Auction Oak is located inside Kyle on Sledge Street, about two blocks south of Center Street. 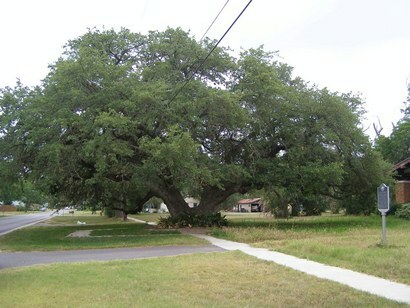 Since there seem to be two distinct trunks, it is sometimes referred to as The Auction Oaks. Kyle Hanging Tree is a few miles down Old Post Road on your left. "With all that's going wrong in the world of development - it's nice to know that something is going right." 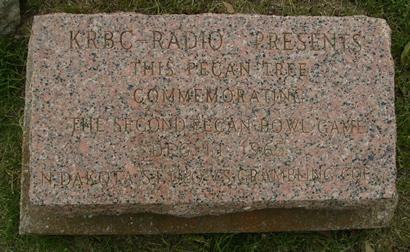 CR 136 SW of Kyle (just S. of the Kyle Cemetery) When John Claiborne and Lucy Kyle built their home on the banks of the Blanco River they had 9 children with them. This large cedar-built dog trot cabin is an excellent example of its type - and the only surviving one in Texas. 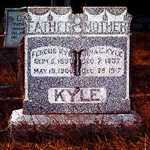 The Cemetery has many stones inscribed with the Kyle name. 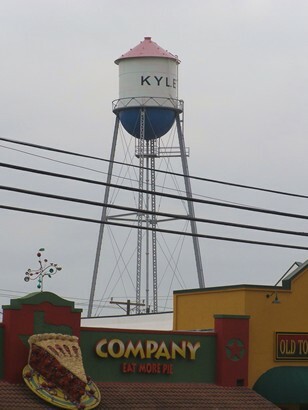 Kyle's distinctive red, white and blue water tower can be seen from any part of the town and has a way of including itself in nearly every photograph of Kyle. 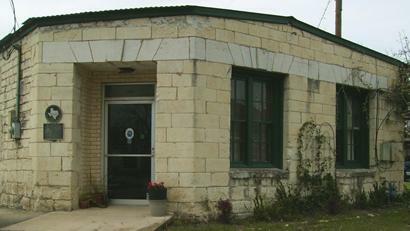 Here are two pictures of the Kyle City Jail. 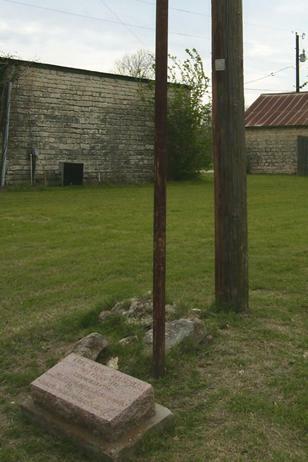 This was moved from Kyle some years ago and added to the western town attractions at Aquarena Springs in San Marcos. 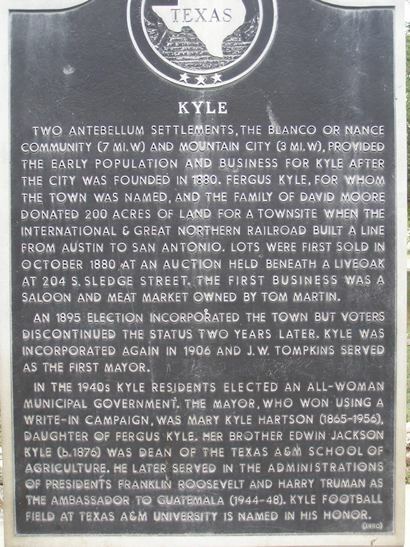 They have since closed that part of the park and offered the City of Kyle the opportunity to come get their jail. The structure was in bad shape and the City did not have a good place to put it so they declined. But we have pictures none-the-less.